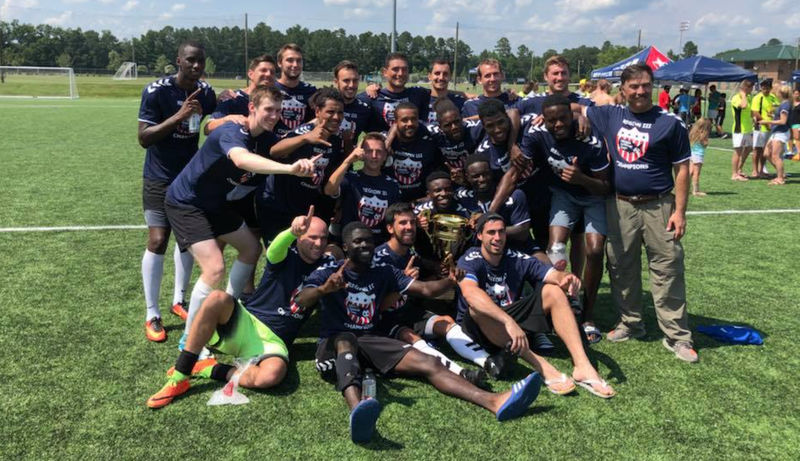 The St. Petersburg Kickers better known as Kickers FC are no stranger to the US Adult Soccer Nationals as they were a national semi-finalist just a year ago. The Florida club founded in 1958 is a six time USASA National Champion with the last championship coming a decade ago in 2008. The list of accomplishments is even more impressive at the State and League level where they have won 30 Florida Suncoast Soccer League championships and 25 Florida State Soccer Association State Championships between their open, Over 30, and Over 40 teams. One of the most notable accomplishments of the club is winning the US Open Cup in 1989 when they defeated NY Greek-American Atlas in Indianapolis, IN. 2017-18 has been another successful year for the club as they have posted a 15-3-1 (W-L-D) record in all competitions and have already lifted four trophies including the Florida Suncoast Soccer League double (league and cup), Florida State Soccer Association State Cup, and USASA Region III Amateur Cup. Manager/Coach Panos Iakovidis has been with the clubs for six years and leads the Kickers FC major. He has led the club to back to back National semi-finals. General Manager Chris McMaster is a former player and coach of the Kickers FC Majors team assists in all types of team logistics and plays for the clubs Over 40 team.